The Power Of Visualizing (And Letting It Go) - Andria Corso & Co.Andria Corso & Co.
I’m sure I’ve written about visualizing before but I recently had such a powerful experience related to it that I had to write about it again. For those of you not familiar with visualizing, it is a common practice used amongst professional athletes and many high performers. When you visualize yourself doing something, your brain literally has no idea whether you’re doing it for real or not. So in essence, it prepares you for future success. Professional golfers and basketball players spend lots of time visualizing those shots before they actually take them. Olympic athletes spend hours visualizing their performance and even their standing on the medal podiums. It’s powerful stuff. A brain scientist I coached actually told me that visualizing reprograms the neural circuitry of our brain so again, it’s powerful stuff! One way that helps me visualize is to create vision boards; a vision board is board (cork board, poster board) of any shape or size that you fill with images and words of the life you desire to live. The act of creating a vision board is a lot of fun as it puts you in that space of visualizing your future and the feelings associated with it. I’ve created many vision boards over the years and inevitably, as I look back on them, the essence of what they contain has manifested in my life. I recently experienced a powerful example of this. 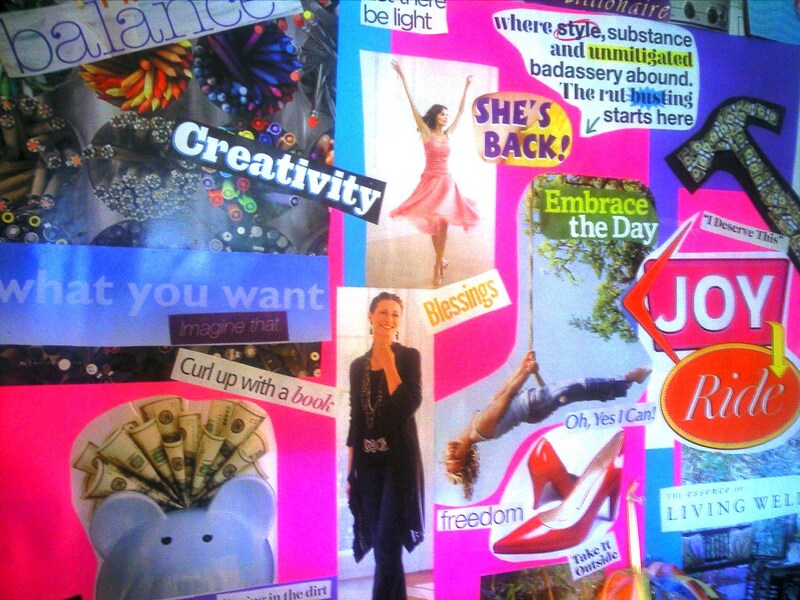 As I said, I’ve created many vision boards over the years and they have been of all shapes and sizes. I created one back in 2012 which was an 8X11 piece of paper. On it I posted my own personal images plus images and words about what I wanted my life to look like in the coming years. I created it in PowerPoint and then posted it up on my bulletin board in my office. The idea around the vision board is to spend time looking at it and visualizing yourself living the life those images represent. Although I did that with this small vision board, as the time went by, it got covered with other things; smaller pieces of paper, notes, and photos that I tacked up on my bulletin board. A few months ago, I was clearing off the bulletin board and uncovered the 8X11 vision board that I tacked up there two years ago. I had mostly forgotten about the images but low and behold, wasn’t I surprised to see some of the biggest manifestations from that board had occurred in my life since I created it? Without even realizing it and after forgetting about those things (letting them go), they came to be. One was an image of the type of home I wanted to be living it. When I created this, I was living in a townhouse in a very congested Washington DC suburb and looking for a home out in the country. 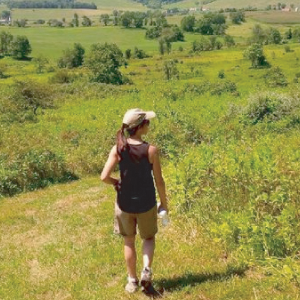 I now live on a piece of property out in the country that very closely resembles the image on that vision board. Some other images were put on the board to represent where I wanted to “spend time and create memories”. One was a photo of the Eiffel Tower and right next to it was an image of a winery, and, in the midst of those images was a photo of my husband and me. At the time I created this vision board we were not yet married. Little did I know when I was creating it that not only would be we be spending time at both the Eiffel Tower and wineries in the near term, but we actually would be getting married in those places. Last year we eloped in Paris. We first had our “legal” ceremony at a VA winery amongst vines that looked very similar to the image on my vision board and then we had a symbolic marriage ceremony at the Eiffel Tower in Paris. Seeing these things on my vision board that was created 2 years ago and realizing that they had all manifested is one of many powerful examples I have which demonstrate how effective these tools can be. The idea here is to create your vision; focus on it and how it feels but then let it go – don’t dwell on it or be overly attached to the outcome. Things don’t always show up exactly the same as the image you insert on your page or see in your mind but the essence of them will eventually show up. I promise! This entry was posted in Blog and tagged Andria Corso, Beliefs, C3 Coaching and Consulting, Decisions, Expectations, focus, Letting go, Life changes, success, Vision, Vision board, Visualization, Visualize. Bookmark the permalink.